Introducción: La evaluación del dolor torácico con electrocardiograma y biomarcadores negativos representa un desafío para el clínico. Como estrategia adicional se utilizan varias escalas para la estratificación pronóstica. Se describe el rendimiento diagnóstico de dichas escalas para los síndromes coronarios agudos en pacientes de alta probabilidad, con electrocardiograma y biomarcadores negativos. Metodología: Estudio de pruebas diagnósticas en una cohorte de pacientes mayores de 18 años ingresados a 2 hospitales de tercer nivel por dolor torácico y sospecha de síndrome coronario agudo, sin cambios electrocardiográficos ni elevación de biomarcadores. Como referente diagnóstico se utilizaron diversas pruebas de estratificación coronaria y para la prueba índice se incluyeron las diferentes escalas para la evaluación del pronóstico en dolor torácico. Se calcularon las características operativas en diferentes puntos de corte y se compararon las áreas bajo la curva ROC. Resultados: Se incluyó a 86 pacientes cuyo promedio de edad fue 63 años (DE: 12); el 61,6% fueron hombres y 51,2% tuvieron diagnóstico de angina. La escala HEART tuvo el mejor desempeño, con un área bajo la curva de 0,65, seguida por la GRACE con 0,61. Los intervalos de confianza se sobreponían entre las diferentes escalas evaluadas. Conclusión: Las escalas de predicción de riesgo en pacientes con dolor torácico, evaluadas con fines diagnósticos, mostraron un pobre poder discriminatorio en una población de pacientes de alto riesgo pese a tener electrocardiograma y troponina negativos. 1. Pitts SR, Niska RW, Xu J, Burt CW. National hospital ambulatory medical care survey: 2006 emergency department summary. Natl Health Stat Report. 2008;7:1–38. 2. Amsterdam EA, Kirk JD, Bluemke DA, Diercks D, Farkouh ME, Garvey JL, et al. Testing of low-risk patients presenting to the emergency department with chest pain. Circulation. 2010;122:1756–76. 3. Goodacre S, Cross E, Arnold J, Angelini K, Capewell S, Nicholl J. The health care burden of acute chest pain. Heart. 2005;91:229–30. 4. 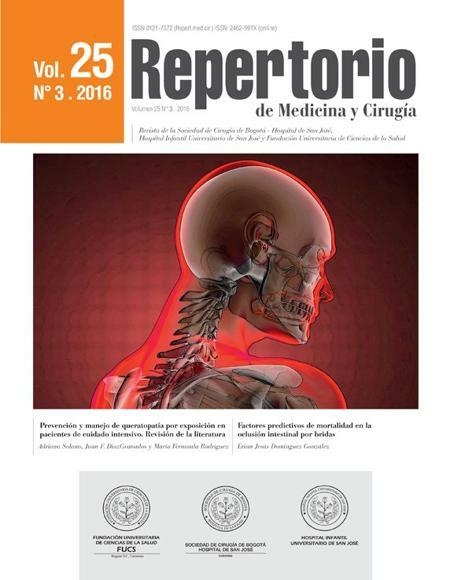 Mendoza F. Dolor torácico con sospecha de síndrome coronario agudo; la importancia del juicio clínico, los exámenes, las unidades de dolor torácico y las rutas críticas. Rev Colomb Cardiol. 2013;20:275–7. 5. Keller T, Zeller T, Peetz D, Tzikas S, Roth A, Czyz E, et al. Sensitive troponin I assay in early diagnosis of acute myocardial infarction. N Engl J Med. 2009;361:868–77. 6. Chase M, Robey JL, Zogby KE, Sease KL, Shofer FS, Hollander JE. Prospective validation of the thrombolysis in myocardial infarction risk score in the emergency department chest pain population. Ann Emerg Med. 2006;48:252–9. 7. Ramsay G, Podogrodzka M, McClure C, Fox KA. Risk prediction in patients presenting with suspected cardiac pain: The GRACE and TIMI risk scores versus clinical evaluation. QJM. 2007;100:11–8. 8. Fuller M, Hamilton D, Holly J, Mallin M, Rayner T, Eshenroder N, et al. Prospective evaluation of a simplified risk stratification tool for patients with chest pain in an emergency department observation unit. Crit Pathw Cardiol. 2013;12:132–6. 9. Conti A, Vanni S, Taglia BD, Paladini B, Magazzini S, Grifoni S, et al. A new simple risk score in patients with acute chest pain without existing known coronary disease. Am J Emerg Med. 2010;28:135–42. 10. Sanchís J, Bodí V, Núñez J, Bertomeu-González V, Gómez C, Bosch MJ, et al. New risk score for patients with acute chest pain, non-ST-segment deviation, and normal troponin concentrations: A comparison with the TIMI risk score. J Am Coll Cardiol. 2005;46:443–9. 11. Six AJ, Backus BE, Kelder JC. Chest pain in the emergency room: Value of the HEART score. Neth Heart J. 2008;16:191–6. 12. Beltrán FM. Dolor torácico en el servicio de urgencias: «un reto por enfrentar». Rev Colomb Cardiol. 2003;10:120–5633. 13. Pope JH, Avfderheide TP, Ruthazer RWR. Missed diagnoses of acute cardiac ischemia in the emergency department. N Engl J Med. 2000;342:1163–70. 14. Sanchís J, Bodí VLA. Risk stratification of patients with acute chest pain and normal troponin concentrations. Heart. 2005;91:1013–8. 15. Jaffery Z, Hudson MP, Jacobsen G, Nowak R, McCord J. Modified Thrombolysis in Myocardial Infarction (TIMI) risk score to risk stratify patients in the emergency department with possible acute coronary syndrome. J Thromb Thrombolysis. 2007;24:137–44. 16. Body R, Carley S, McDowell G, Ferguson J, Mackway-Jones K. Can a modified thrombolysis in myocardial infarction risk score outperform the original for risk stratifying emergency department patients with chest pain? Emerg Med J. 2009;26:95–9. 17. Hess EP, Agarwal D, Chandra S, Murad MH, Erwin PJ, Hollander JE, et al. Diagnostic accuracy of the TIMI risk score in patients with chest pain in the emergency department: A meta-analysis. CMAJ. 2010;182:1039–44. 18. Backus BE, Six AJ, Kelder JC, Bosschaert MA, Mast EG, Mosterd A, et al. A prospective validation of the HEART score for chest pain patients at the emergency department. Int J Cardiol. 2013;168:2153–8. 19. Weisenthal BM, Chang AM, Walsh KM, Collin MJ, Shofer FS, Hollander JE. Relation between thrombolysis in myocardial infarction risk score and one-year outcomes for patients presenting at the emergency department with potential acute coronary syndrome. Am J Cardiol. 2010;105:441–4. 20. Holly J, Fuller M, Hamilton D, Mallin M, Black K, Robbins R, et al. Prospective evaluation of the use of the thrombolysis in myocardial infarction score as a risk stratification tool for chest pain patients admitted to an ED observation unit. Am J Emerg Med. 2013;31:185–9. 21. Conti A, Vanni S, Taglia B, Del Paladini B, Magazzini S, Grifoni S, et al. A new simple risk score in patients with acute chest pain without existing known coronary disease. Am J Emerg Med. 2010;28:135–42. 22. Fesmire FM, Martin EJ, Cao Y, Heath GW. Improving risk stratification in patients with chest pain: The Erlanger HEARTS3 score. Am J Emerg Med. 2012;30:1829–37. 23. Melki D, Jernberg T. HEART Score. Crit Pathw Cardiol. 2013;12:127–31. 24. Six AJ, Cullen L, Backus BE, Greenslade J, Parsonage W, Aldous S, et al. The HEART score for the assessment of patients with chest pain in the emergency department: A multinational validation study. Crit Pathw Cardiol. 2013;12:121–6. 25. Macdonald SPJ, Nagree Y, Fatovich DM, Brown SG. Modified TIMI risk score cannot be used to identify low-risk chest pain in the emergency department: A multicentre validation study. Emerg Med J. 2014;31:281–5. 26. Boubaker H, Grissa MH, Beltaief K, Haj Amor M, Mdimagh Z, Boukhris A, et al. A new score for the diagnosis of acute coronary syndrome in acute chest pain with non-diagnostic ECG and normal troponin. Emerg Med J. 2015;32:764–8.